The second term on the right side of the equation is often referred to as the "industrial mix," while the final term on the right side of the equation is often referred to as the local area's "competitive share." This language is adopted in Graphic 16. The impact of MEGA credits cannot be directly measured from this shift-share analysis. However, MEGA credits are meant to have a positive influence on an area's economy independent of overall trends in state employment or in the shift of the industrial mix in manufacturing. Consequently, MEGA credits in recent years should be strongly positively correlated with a local area's manufacturing employment growth. That can be tested statistically. From 1995 through 2000, there were 107 MEGA deals, and the life of the credits ranged from five years to 20 years into the future. For the purpose of this analysis, only deals that resulted in the start of operations prior to 2001 were included. Hence, if a deal was approved by MEGA in 2000, but operations did not begin until 2003, that case was excluded from the study. The shift-share analysis was performed for each of Michigan's counties from 2001 through 2007 using the state of Michigan as the region of comparison. The results of that analysis are presented below for manufacturing employment by county. 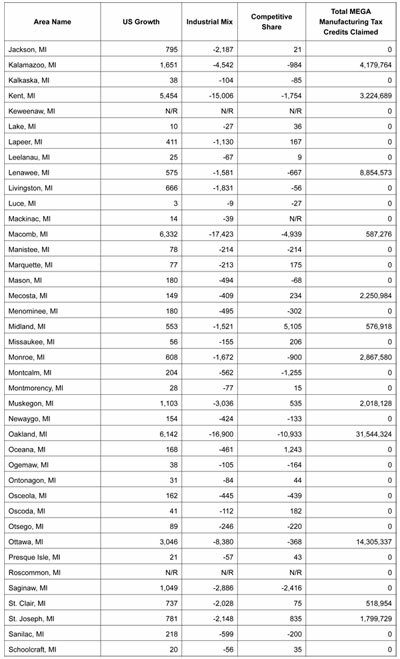 The "Michigan's growth" column represents the change in employment or "jobs" from 2001 to 2007 attributable to Michigan's overall economy. The "industrial mix" column represents the change in jobs attributable to the growth (or decline, in this case) of statewide manufacturing. Finally, the "competitive share" column represents the change in the county's manufacturing jobs due to characteristics of that particular county. Source: U.S. Bureau of Labor Statistics, Michigan Economic Growth Authority, and calculations by Michael Hicks. The MEGA tax credit data was filtered to separate manufacturing facilities from nonmanufacturing facilities. The MEDC included Standard Industrial Classification codes for most credits, and only the manufacturing SIC codes were included. There were seven instances where SIC codes were absent. In these cases, the credits were sorted by scanning the credit's Briefing Memo for a description of the facility. Only facilities primarily engaged in the creation of goods were included, meaning that some companies with SIC manufacturing codes were excluded. 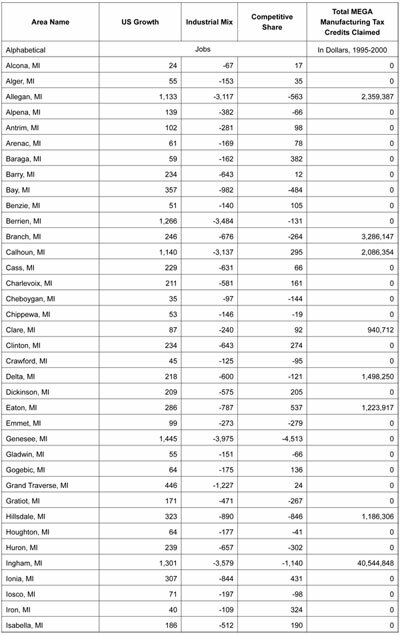 This shift-share analysis is useful in further testing the effect MEGA grants have actually had on manufacturing employment in Michigan counties. 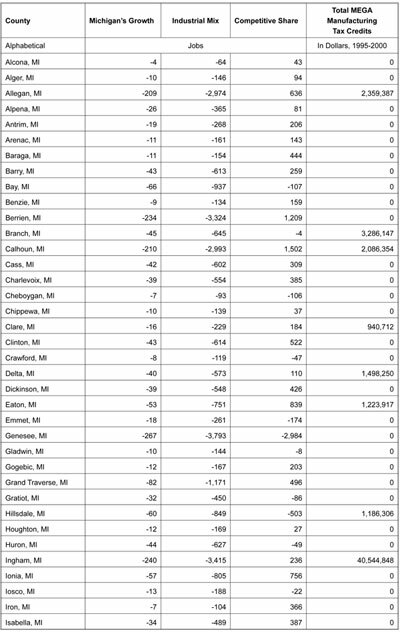 The first test performed by Hicks determined whether a MEGA grant provided to a business in each of the 83 Michigan counties prior to 2001 was associated with subsequent employment change attributable to county-specific competitive-share job growth in manufacturing. 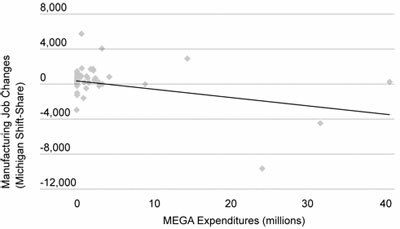 In this statistical test, Hicks found that the MEGA grant was correlated with a reduction in manufacturing employment. Every $1 million in MEGA credits awarded was associated with a reduction of 95 manufacturing jobs. The decline in manufacturing employment related to MEGA tax credits was strongly statistically significant. A t-test also indicated it was extremely probable that the relationship between MEGA credits and changes in the county's manufacturing employment is negative. A scatter plot of this relationship is telling. In Graphic 17, county-level changes in manufacturing employment attributable to county-specific conditions appear on the vertical axis, while the total MEGA credits from 1995 through 2000 appear on the horizontal axis. There is no clear linkage between the two, and the fact that the statistical relationship is negative strongly discounts the argument that the MEGA program is improving employment in manufacturing. Source: Calculations by Michael Hicks. Statistical tests point to a strong negative relationship between MEGA and manufacturing employment changes attributable to county specific competitiveness. 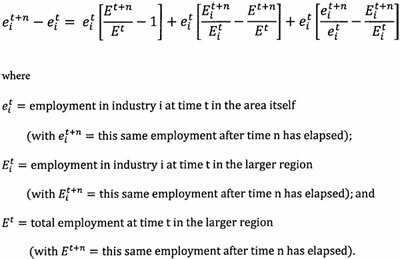 While this model does not assert causation - i.e., the model does not imply that MEGA grants are destroying manufacturing employment in the counties the authority targets - it is clear that MEGA's efforts to promote manufacturing employment have not been successful. This relationship is surprisingly strong in statistical terms and suggests MEGA has no positive effects on manufacturing job growth in Michigan (see Graphic 18). 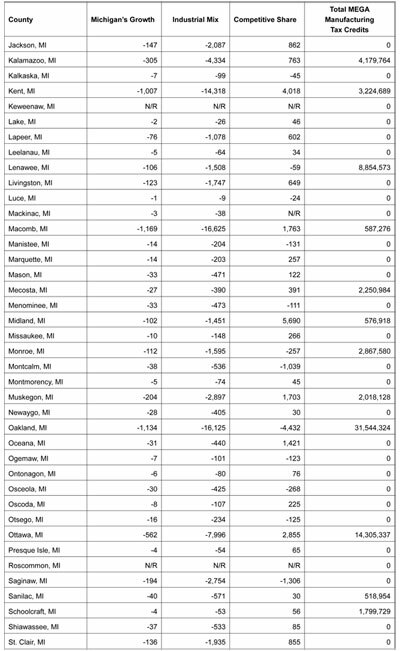 To check that the county competitive shares were representative of changes unique to the counties themselves, rather than an accidental product of the choice of the state of Michigan as the region of comparison, we recalculated the shift-share analysis using the United States as the region. The results of that analysis appear in Graphic 19. Source: U.S. Bureau of Labor Statistics, Michigan Economic Growth Authority, and calculations by Michael Hicks. Graphic 20 shows a scatter plot of the relationship between the county's "competitive share" from 2001 through 2007 with the nation as the region and the claimed MEGA manufacturing credits in the years 1995 through 2000. 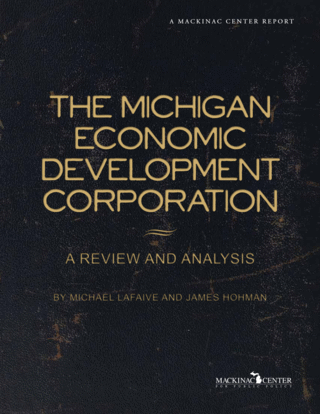 Note that the negative relationship is roughly the same, indicating that the earlier analysis of the county competitive share was not an artificial result of using the state of Michigan as the region for comparison. Characteristics specific to County X's manufacturing environment were responsible for the remaining 20 jobs, which are 40 percent of the 50-job total. In this case, the 50-job increase in County X's manufacturing sector was pretty good, since 20 of the jobs, or 40 percent, are due to purely local trends that were independent of statewide employment and manufacturing growth.